Yellow or stained teeth are a common problem most Americans will develop at some point in their lives but can remedy with proper treatment. 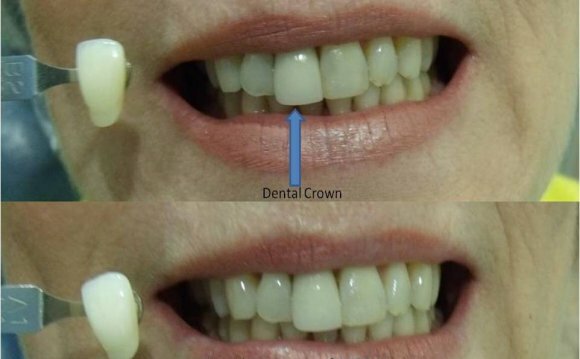 Our teeth contain enamel, a porcelain-like surface that started out sparkling white. Tooth enamel is designed to protect the teeth from the effects of chewing, gnashing, trauma and acid attacks caused by sugar. Over time, our enamel starts to hold stains within its pores and becomes more transparent and permits the yellow color of dentin, the tooth's core material, to show through. As more stains and debris accumulate because of normal wear and tear and eating habits, the teeth develop a dull, lackluster appearance. Tooth whitening exists to remove the stains and debris associated with diet and aging. Extrinsic Staining- Extrinsic stains are caused by external factors such as coffee, red wine, tea, other dark-colored foods and drinks, tobacco and routine wear and tear. Essentially they are a natural part of life but they are unsightly and can be removed. Superficial extrinsic stains can be removed with good hygiene techniques such as regular brushing and dental check-ups with cleanings. More stubborn stains can be removed with more involved efforts like teeth bleaching or whitening. Intrinsic Staining- Intrinsic stains occur much deeper in the tooth than extrinsic stains, forming in the interior of teeth. They can result from trauma, aging, exposure to minerals (like tetracycline), during tooth formation and/or excessive ingestion of fluoride. According to the FDA, the difference between bleaching and whitening is that the term "bleaching" is permitted to be used only when the teeth can be whitened beyond their natural color and when the products contain bleach. Whitening refers to restoring a tooth's surface color by removing dirt and debris. Strength of Bleaching Agent- Typically OTC products and take-home products usually contain 3% to 7% hydrogen peroxide bleaching agent whereas in-office teeth whitening products contain 15% to 43% hydrogen peroxide. Mouthpiece Trays- Mouthpiece trays from the dentists as opposed to OTC trays are custom molded to fit the exact impression of your teeth. This allows for maximum contact between the whitening gel, which is applied to the mouthpiece tray, and the teeth. A custom mouth tray also minimizes the gel's contact with gum tissue, which can lead to gum irritation that may be associated with trays that are not custom-made. Additional Protective Measures- In an office setting, the irritation and concerns associated with the gums from gel contact are protected by your dentist as an extra preventive measure. Supervised vs. Unsupervised Process- A dentist-supervised at-home or in-office treatment may be safer because it allows the dentist to view your medical history and determine which course of whitening treatment is most appropriate for you. With OTC treatments, you are left on your own. The American Dental Association (ADA) has approved the use of dentist-dispensed home-use products containing 10% carbamide peroxide and office-applied products containing 35% hydrogen peroxide. Over-the-counter bleaching products are not endorsed by the ADA because the organization believes that professional consultation is important to ensuring safe and effective use. Just because a product does not met the ADA standard does not mean it is not safe or ineffective. It is wise to consult with your dentist if you are concerned about a product you are interested in trying.